This could have, should have, been a glorious day. We were set to drive across Tuscany, taking in three gravel Time Trials, in a route plan that has received lots of pre-planning. All of this had to be tossed aside earlier today as the ferry from Greece arrived late – it was 12.30 before the cars ran down the ramp into the streets of Ancona. Superfast Ferries had proved to be Superslow, and changes were therefore inevitable. Cars had a main road route to Viareggio, and we are in two very grand hotels on the sea-front, the Principe di Piemonte, and the Grande Royal Hotel…luxury on a hot-tap, but there is no hiding the disappointment that once into mainland Europe we had hoped that re-routes would be a thing of the past. 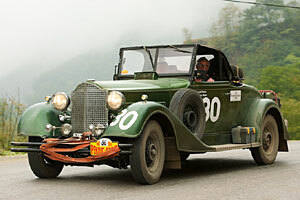 We are off to Aix les Bains tomorrow, with four Time Trials set up with the help of additional marshals who have come out of the UK to strengthen the team.